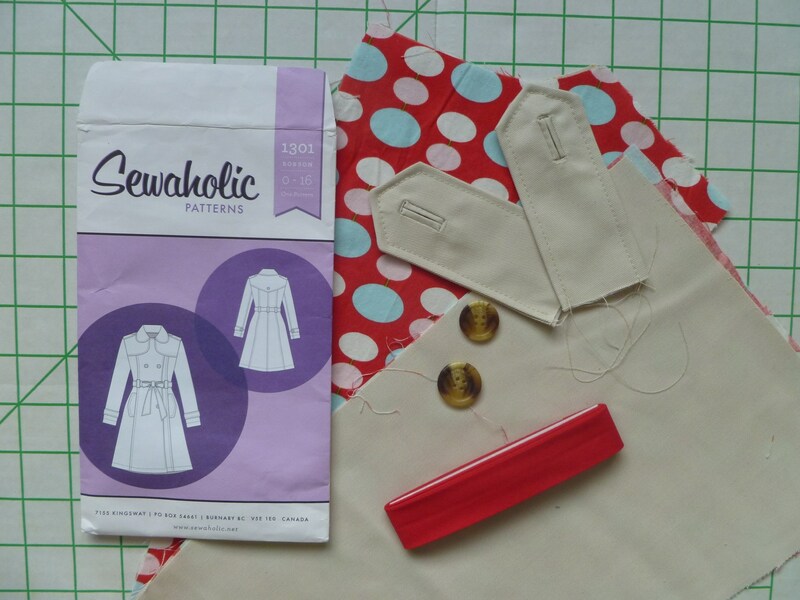 Sewaholic Robson Trench Coat – In Progress…. | cut it out, stitch it up! Sewaholic Robson Trench Coat – In Progress…. Back in spring I was thinking about jackets and settled on the idea of a trench coat then thought I’d have a go at making one. I googled patterns and my favourite was the Sewaholic Robson Trench Coat. The main fabric is a stone coloured gabardine from Calico Laine. The pattern is unlined but I decided to underline with a patterned cotton which I picked up from John Lewis. It is a Tanya Wheelan print, it was on sale at half price which helped with the decision. The seam allowances are bound so I bought a matching red ready made bias binding. The style needs 16 or 17 buttons and I finally found some reasonably priced ones on Simply Sewing. I bought two sizes, one size for the front opening and slightly smaller ones for the epaulettes, back yoke and cuff tabs. Just to make it more of a challenge I decided to try bound button holes for the first time. 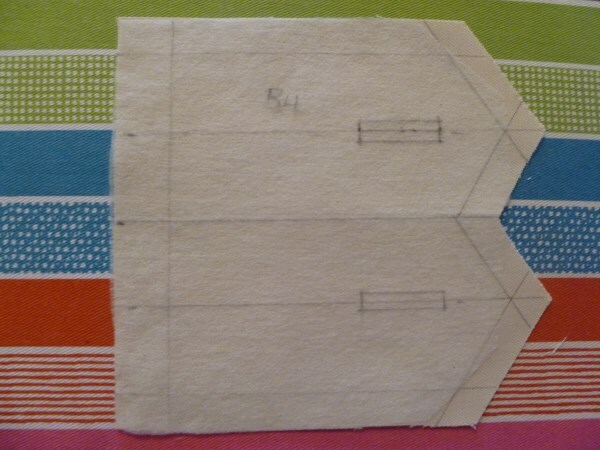 I started off by following the patch method described in Gertie’s new book for better sewing. They weren’t very successful so I tried the method where you make two tiny welts but this looked even worse. I had a look in Claire Schaffer’s Couture Sewing Techniques and this had the patch method so I tried again. I re-drew the pattern piece straight onto the interfaced fabric and marked all the seam allowances and the position of the button hole. The point on the first epaulette I made wasn’t quite even so by drawing the stitching lines I could get it spot on. I stitched a large square patch to the front of the button hole carefully stitching along my drawn lines, counting the stitches on the short side and making sure I did the same amount on the opposite end. One tip I read was to start in the centre of one of the long sides, not at a corner. After some careful snipping I turned the patch to the wrong side and folded to create the welts making sure they were of equal width. I secured them by ‘stitching in the ditch’ by hand and then stitching by machine the little triangle fold back at each end of the welts inside. So after a bit (a lot) of practice I was happy with the results. To make the corresponding opening in the underside I used a patch of lighter weight fabric, which once folded through I topstitched around. 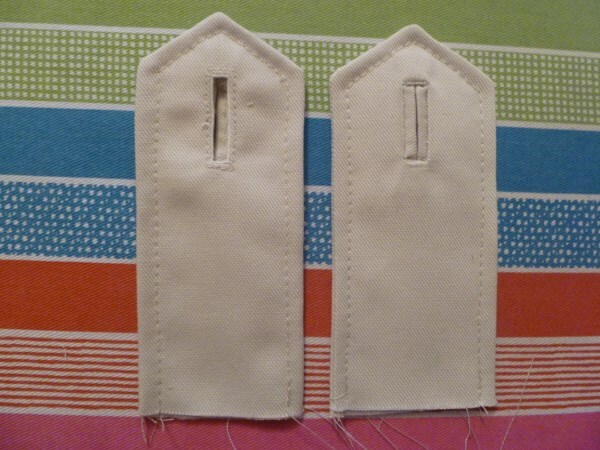 By following the drawn on stitching lines the shape of the epaulettes worked out well. I’ve made up the shoulder yoke with the button hole and have started on the cuff tabs. Once those are out of the way I need to crack on with the button holes for the front opening. 4 on the front piece and 3 on the under piece. I think I’m putting off starting them and doing other bits first, collar has been made up and everything underlined. Thanks, I’m half way through the 7 buttonholes I need to do for the front opening. Doing the under flap first and getting better as I go. Hopefully the ones you will see on the front flap will be the best. Yep, autumm is here. Good for you!!! I am proud of you. I have yet to try them and surely it won’t be on my first (upcoming) Robson coat. I’m happy with how the buttonholes looked on the back flap and epaulets but stuffed them up on the main coat opening, I think the underlining didn’t help here. Then my mojo for the coat flew away. I hope it won’t be an unfinished project for ever…..
Oh my :(; me neither – I too hope it’s not a lost cause. I guess ’cause I’ve gone loopy over this pattern I expect everyone else to. Frankly I have not the money this second to buy all that I need to complete it, but I am claiming this coat as a November “Make A Garment A Month” challenge project. I don’t even have the pattern yet; it has been ordered. But I’ve got my eye open for suitable fabric deals to make this baby. I do hope I can find 60″ width fabric so I need only 4.5 yards versus the over 6 yards for 45″ fabric, you know. Thanks for the follow. I’m looking forward to reading your blog too. Good luck with your November make. I think I over complicated things by underlining. Hopefully you will find a 60″ wide fabric. I’m in the UK and found that most twills were 60″ wide and not too expensive.